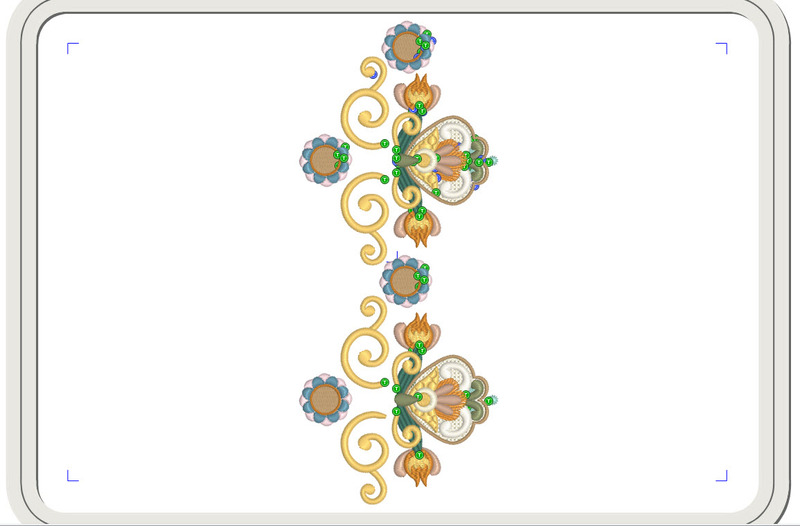 My new Plume de Elegance 3 designs contains some superb designs including a special border design and I would like to show you how to create a rich border with this design and how easy it is to change its appearance by just two colour changes. The design is GFE-PDE-3-4 and as you can see it has been created in such a way that it will sit beside itself. Usually for this type of design I would add the last flower on the right as shown in the image below, but due to the size of the design the hoop would not accommodate it. In these circumstances the flower is stitched out last so it can easily be eliminated but it is easy to add it if you have a larger hoop. GFE-PDE-1-15 in the first set in this collection is the single large flower which can be added to this design if necessary. 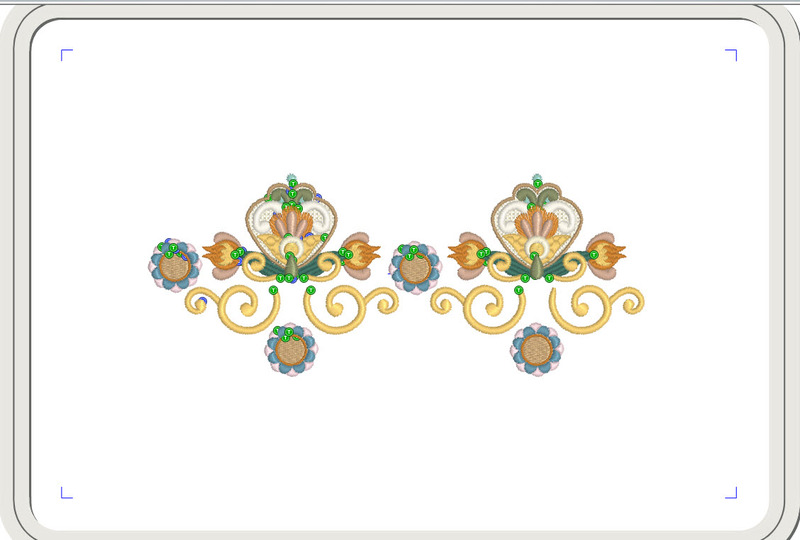 However you could also add the flower in your embroidery software. Let me show you how. I am using the Husqvarna Premier software to do this so the process may be a little different from other software programmes, but hopefully this will give you an idea of the principle. Decide firstly whether you will be needing the Outline alignment stitches (OAS) and it so you will need to open GFE-PDE-3-4-S. For the sake of this tutorial I have used the design without OAS so they will not show in the following images. The adaption will still work though as the alignment occurs on the left of the design rather than on the right hand side. Open the design in your editing software and save it giving it a new name so that if anything happens to the file you still have the original. Select the whole design and rotate it 90 degrees, as this makes it easier to work with. 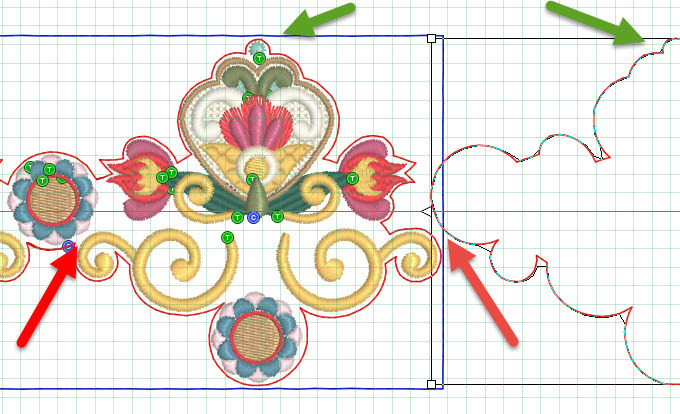 Zoom into right hand lower section of the design so that the gaps around the flower are wider. Use one of the selection tools to select the flower at the bottom right. 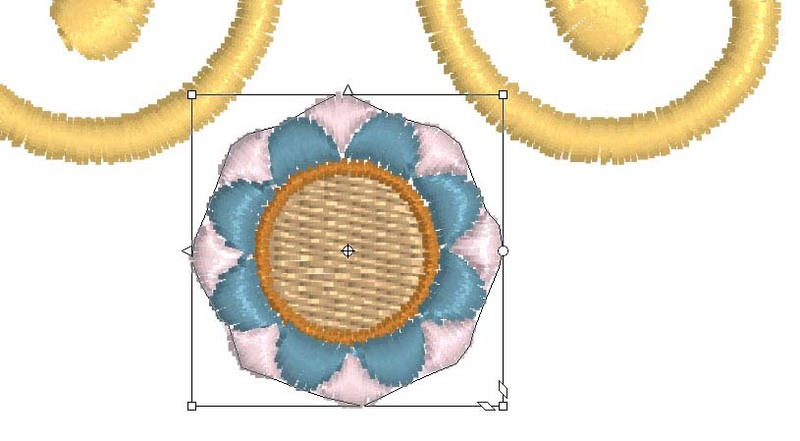 I prefer my lasso tool or free hand selection tool, rather than the box tool as it could inadvertently select the gold stitches of the scrolls. Copy and paste the flower. Then move the flower into position. To align it perfectly it will be helpful if you turn on your grid, paying particular attention to the grid line that the other flower sits beneath and also the gap between the gold scrolls and the flower. At this point colour sort the design so all the flowers stitch out together. This will reduce the number of colours in the design from 28 to 20. Rotate the design vertically in readiness for your hoop and save it. You may want to use the design as it is or to create a border with it changing some of the colours. For example say that you are going to stitch a panel measuring around 27″, which will be attached to a towel or a pillow case. As the design is 8.83″ wide you will need to stitch it out 3 times. You will need to open the design from the folder with Outline alignment stitches (OAS) as these will guide you in the correct placement if you machine cannot do this for you. Even if it does you may find these invaluable. 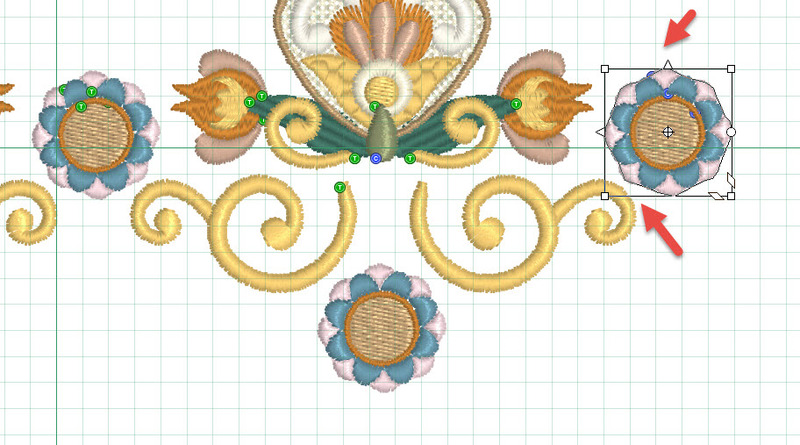 I am going to show you the process in my embroidery software. Here it is opened with the red and blue outline alignment stitches. To change the colours select #4, 9 and 14 and change them to your new choice of colour. I am going for a dark pink colour way so I am selecting Sulky Rayon 1558 Tea rose. Colours #5 and 16 changed to Sulky Rayon 1119 Dark mauve. These two colour edits significantly changes the appearance of the design, although you may want to make other adjustments. When you stitch out the design you need to just hoop your stabiliser and stitch out the first colour, the red OAS. This give you the shape of the design and helps position your fabric correctly. Attach with temporary adhesive, and or pins outside of the stitch area. Then stitch out the second colour, the blue OAS which will secure your fabric in place before you complete the embroidery. Complete the design and trim away the excess stabiliser but leave the red and blue OAS in place. Hoop up another piece of stabiliser and stitch out the red OAS again. 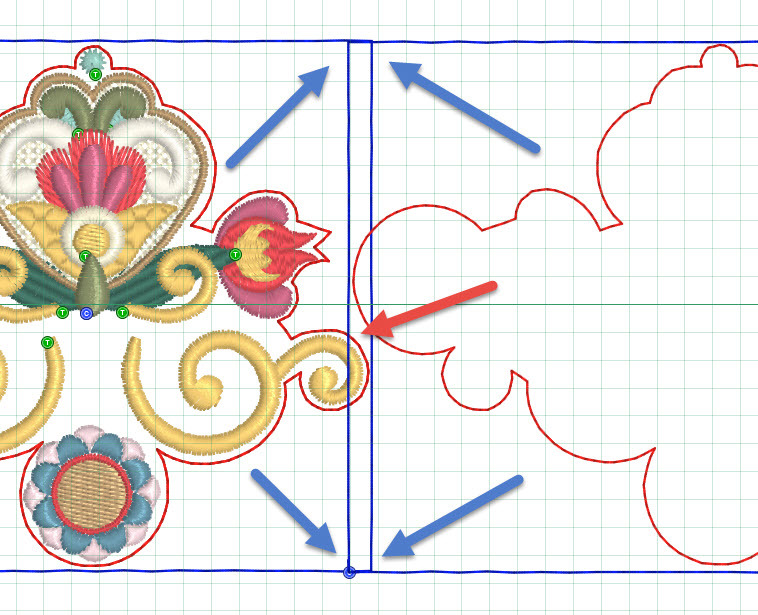 Now use them as a guide to place the embroidery correctly as shown in this image, taking particular care to match the gaps between the green arrows and to make sure that the top of the design shown by the red arrows are level. Now you can attach the fabric as before and stitch out the blue OAS. 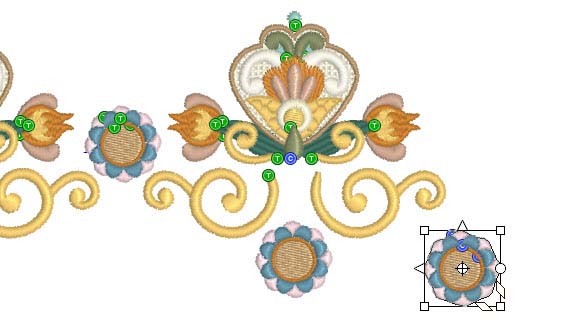 Remove the hoop from the machine if necessary and check the back of the embroidery to check the gap between the flower of the first design and the curve of the red OAS shown by the red arrow. If your blue boxes are level top and bottom too, then you have placed the design correctly and can finish it off. However it is easy to remove the blue OAS if you are not happy and re-apply them. Do exactly the same for the third stitch out of your border and use your adapted design if you want a large flower on the right hand edge as shown here. Make sure you have changed the colours for this design too. When the embroidery is complete you can remove the OAS, the stabiliser and any jump stitches. Press the embroidery from the back to set the stitches and remove any creases. Then your panel is ready to be attached to your pillow or towel by the method of your choice. These Plume de elegance designs have an eastern flavour with their rich colours, and will be released on 3rd April, 2016, fitting large 9.5″ x 6″ hoops. The final set in the collection features designs for the 12″ by 8″ hoop including this lovely design which I am working on to be stitched out in 3 hoopings! 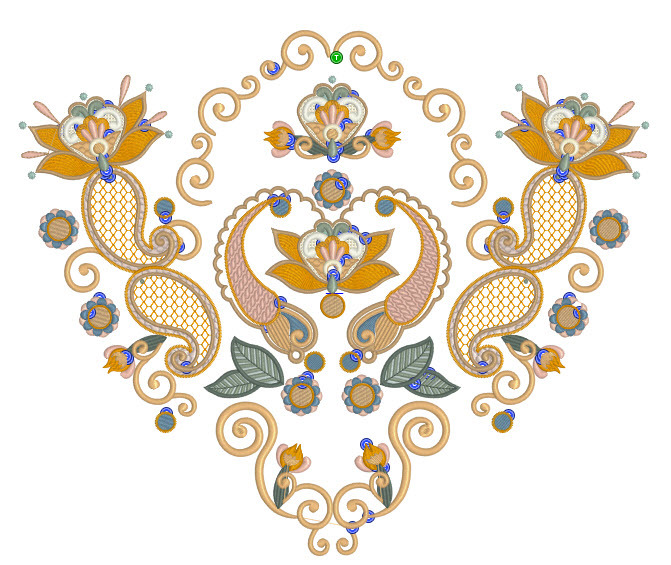 I can see this as a beautiful jacket back or embroidered on a special bag! This entry was posted in Announcements, New Designs and tagged colour changes, combining embroidery designs, development of embroidery, Hooping only stabiliser, machine embroidery, Outline alignment stitches, Placement of designs, The importance of colour. Bookmark the permalink.